Vicki Cham teaches a citizenship class at Fresno Interdenominational Refugee Ministries, or FRIM. She asks questions in English and then repeats them in Lao because she says most people will have to take their citizenship tests in English. A lot of her students are older and from Southeast Asia. Students taking a citizenship class at Fresno Interdenominational Refugee Ministries, or FRIM. They've been in the U.S for years and many of them came here after the Vietnam War. But, since 2016, there’s been a big push for these refugees to get sworn in. “They’re all concerned about the situation right now, you know, that’s why they want to hurry up and become citizens just in case something changes in the future or if the administration might change some laws," Cham says. Last year is also when many clients asked FIRM to offer citizenship classes, Cham says. FIRM, a faith-based nonprofit, mostly serves refugees from Southeast Asia. Now FIRM offers citizenship classes for an hour three days a week. Some people wanted the classes because they said they were afraid of being deported. Others are just wary of President Donald Trump's immigration policies. “Some folks don’t even dare to leave their homes, just afraid that they might get pulled over for no reason, maybe a traffic stop or something," says Lucky Siphongsay, a program manager at FIRM. Siphongsay says refugees are scared even though the people the U.S. deported had committed crimes. “But having that anxiety, just to leave your home, that’s a big problem and I don’t think any American should feel that way,” he says. The Trump administration has “woken up“ the Southeast Asian community, Siphongsay says. “So there’s a sense of urgency here in this community," he adds. Everyone taking these classes is a green card holder and Siphongsay says most had been comfortable with that status. Back in the late '80s and early '90s, language barriers and a lack of education made it difficult for people to naturalize. "There was no organization or resources to even educate the Lao community about citizenship,” Siphongsay says. Even now, application fees and childcare are roadblocks. Thou Ma, who's taking citizenship classes at FIRM, says in Lao that she's been wanting to take a citizenship class for a long time but wasn't able to because she was too busy with young kids. Now that her children are older and in school, she says she can spare the few hours a week to take the class. Thou Ma and Deuan Pheng in a citizenship class at Fresno Interdenominational Refugee Ministries, or FIRM. Another student in the class, Deuan Pheng, is taking her citizenship test this week. She says in Lao that she's been in the U.S for more than 35 years. Pheng says she came to Fresno as a refugee during the Vietnam War. Now, she’s used to American culture and customs and says she’s looking forward to being a U.S citizen. 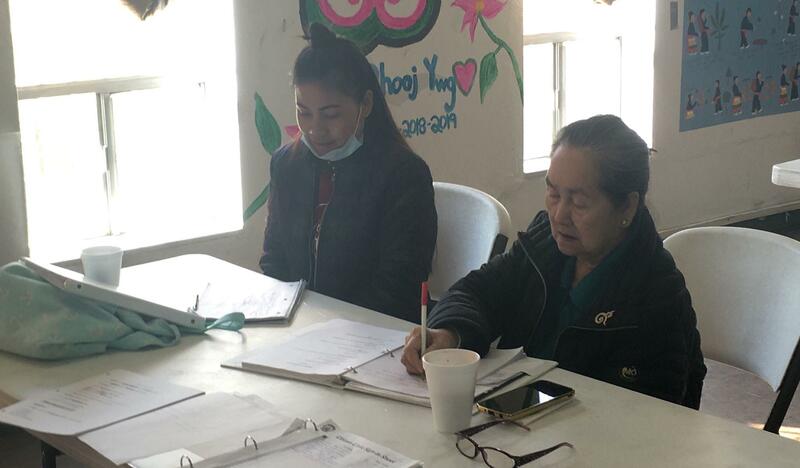 Other organizations, like the Fresno Center, have also seen an uptick of people taking citizenship classes. 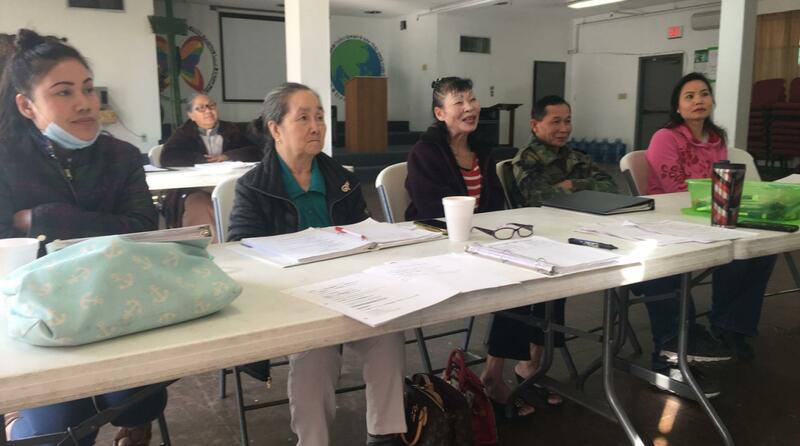 “I have four people working on the naturalization process and we’re booked for the next two months," says Pao Yang, executive director of the Fresno Center, a nonprofit that provides services to Southeast Asian communities in Fresno County. "That is a direct effect of the sanctions on Laos." Yang says with social media and the 24-hour news cycle, people are more informed about what’s happening between Laos and the U.S., and it’s struck a chord.